These blueberry muffins had been on my radar for quite some time, but for one reason or another I didn’t get around to making them until last week. They were so good!! 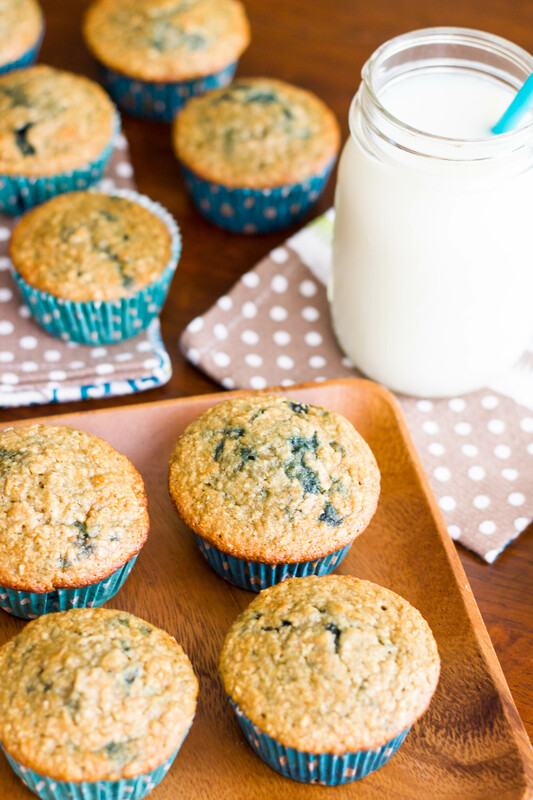 Of course, I haven’t tried a Skinnytaste recipe that was bad, and you guys know how much I love muffins =). 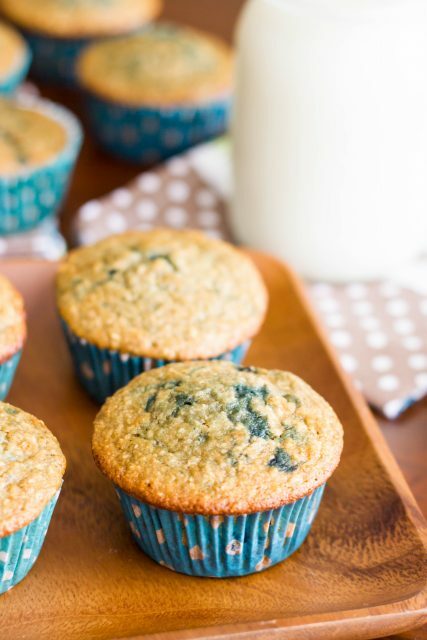 I especially love “skinny” muffins that don’t taste skinny at all! 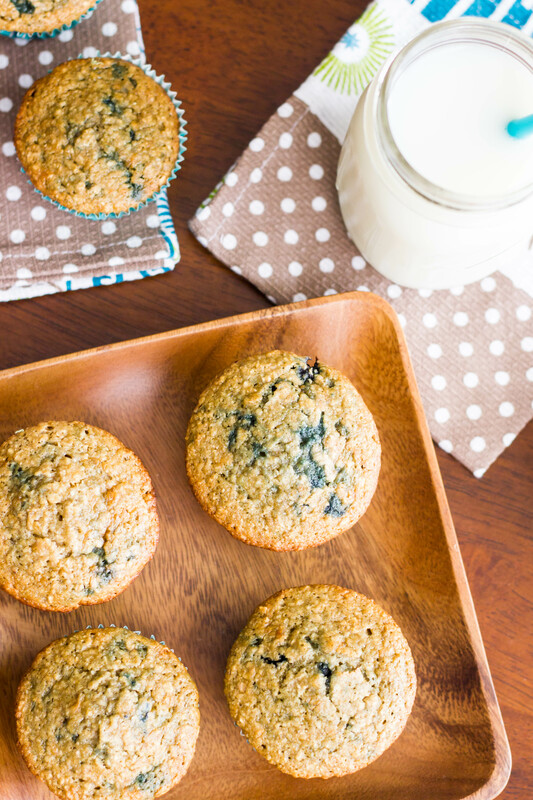 Soaking the oats in milk for ~30 minutes help keep the muffins perfectly moist and healthy – only 127 calories each. You could easily use this base for any fruit or nut you like. A perfect on-the-go breakfast. Enjoy! 1. Preheat oven to 400°. Line 12 muffin cups with liners or spray with nonstick spray. 2. Place oats in a food processor and pulse a few times. In large mixing bowl, soak oats in milk for about 30 minutes. 3. Add brown sugar, honey, applesauce, vanilla, egg whites, and oil to oat mixture and mix well. 4. In separate bowl, combine whole wheat flour, salt, baking powder, baking soda and whisk to combine. 5. Add flour mixture to oat mixture. Stir a couple times to partially incorporate the flour (NOT fully!). Add the blueberries and mix until just incorporated. Be careful not to overmix. A few lumps are okay! 6. 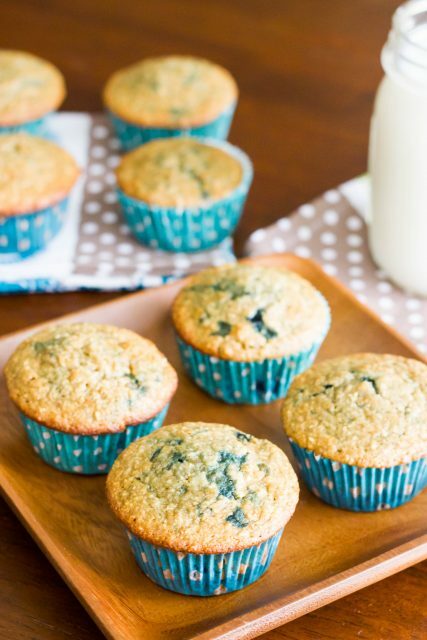 Divide batter among prepared muffin cups and bake preheated oven for 22 minutes or until golden brown. Makes 12 muffins. Nutritional Info (per muffin): 127 calories; 2.3 g fat; 28.4 g carbohydrates; 2.2 g fiber; 2.8 g protein.